“I’m happy just to be outside looking at the countryside!” I exclaimed from the passenger seat of Tashi’s car as our car ride hit the two-hour mark. Such is the life of a college student: your outdoor endeavors are so diminished that somehow just leaving campus can fulfill that itch. 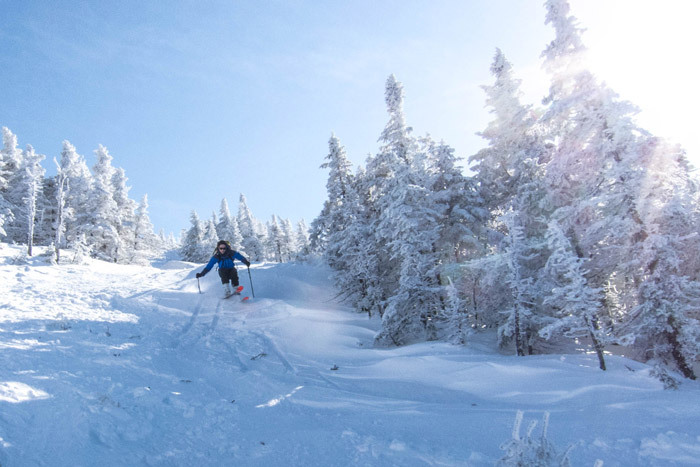 I arrived back in Maine after winter break with a new pair of Fischer Trans Alp 88 touring skis, mounted with my faithful G3 Ion LTs and a fresh punch bulging out the side of my Scott Cosmos touring boots. Most people around here are anxious about their upcoming midterm; I was anxious about that new shine still on my skis—they needed to get out, and so did I. After avalanche conditions turned us away from Mt. Washington (the classic New England touring spot), we settled on Saddleback Mountain, a defunct ski lodge. 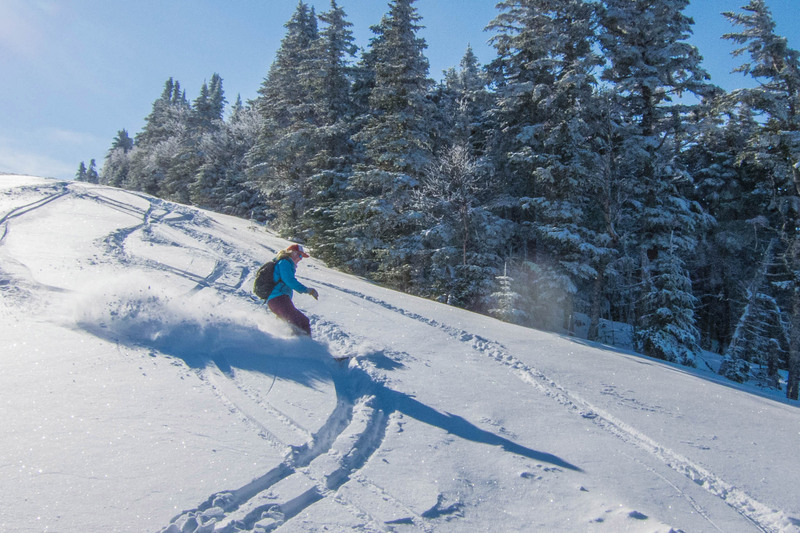 The mountain has lifts and a lodge, but is completely non-operational, and has become a destination for backcountry skiers in the last two years. There were no more than 10 other cars in the parking lot when we pulled in around 9:30 that morning (not bad for a resort, but quite a lot if you’re in the backcountry mindset). We started up the skin track that follows the liftlines up and left towards the top of the highest lift. Though it was 23º, the trees blocked any wind and the sun warmed us as we climbed. It took no more than an hour to reach the top of highest lift, and another 10 minutes to traverse to the best ski runs. 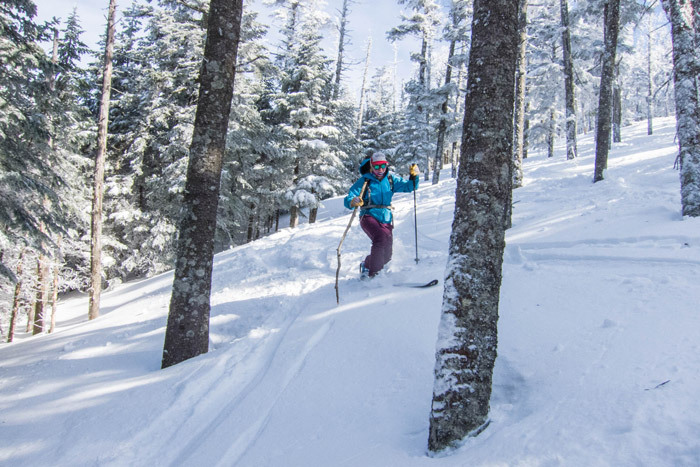 We dropped in first on “Run 3.” The runs starts in tight trees, which led to a section of open, windblown (might as well just call it “East Coast”) snow. However, we soon found patches of more open trees, which boasted 5-6 inches of soft, fresh powder. The large shovel on my Trans Alps plowed through the snow and around the trees and I yelped with joy at each turn. The run was over disappointingly quickly, but after a quick snack, we transitioned and headed up once more (the best run is the upper half of the mountain, so we only went down halfway, meaning our uphill only lasted 20-30 minutes the second time). “Run 4” was even better, with few tracks and superior snow. Tashi, my ski buddy and a telemark skier in-progress sprayed through the (surprisingly good, given the warnings I’d gotten about the East) snow as we zipped around trees. We did one more lap just 2/3 up the skin track before meeting up with our companions who’d been on snowshoes. We mobbed towards the parking lot and headed back to campus. Saddleback felt a little like Timberline in that there are lifts and lots of other people around while participating in a sport that normally allows one to access remote areas. However, the snow was surprisingly good, the people were friendly, and we all left feeling satisfied. I would definitely recommend Saddleback as a place to tour, especially for those with relatively little touring experience who want to learn in a controlled environment.